Redbones, we are forever in your debt. When, after seven hours of plodding, we finished our first annual Walk (Amble) for Hunger, crawled back to Nacho Patrol World Headquarters and found ourselves in dire need of some hearty BBQ, you delivered…for free, and on a bike. The ample array of meat you provided that night gave us the strength to carry on (to the shower and then to bed). We’ve been craving you ever since. We’ve known for a long time that you had nachos, but the description wasn’t hurrying us out of the house: two kinds of cheese, guac, salsa, jalapenos and sour cream. The bartender Mike (or Eric, we’re not sure) must have agreed with us because he clued us in to the off-menu nachoption with all the above toppings and a heaping pile of pulled pork. From now on, we will always ask, “who can we talk to about nachos?” before we order. 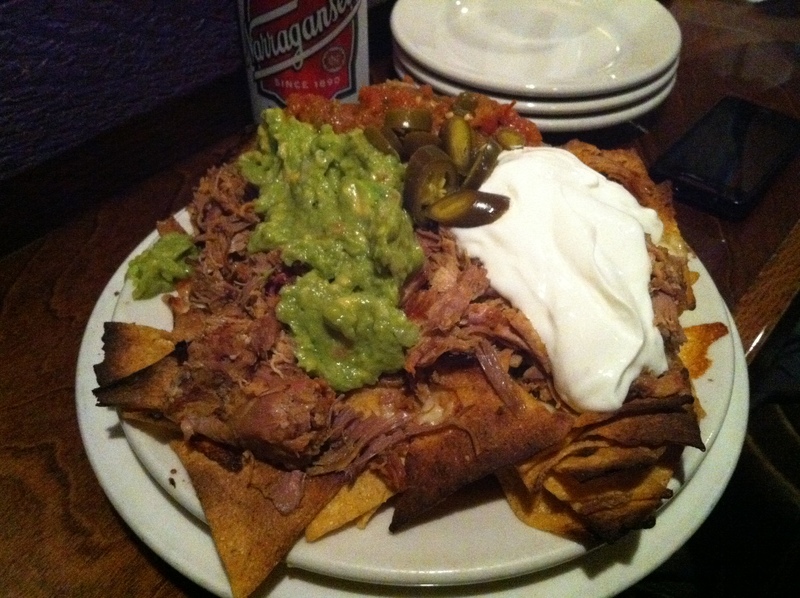 Appearance: (8) You wouldn’t see these on Top Chef Masters, but these nachos demanded our gastronomic attention. Don’t you just want to dive in and cover yourself in all that perfectly smoked pulled pork? The burnt chips and sour cream waterfall pulled down the rating a few points, but the guac, tomato, and moist mountain of meat all but makes up for any shortcomings. Quality of Ingredients: (9) We recorded our thoughts mid-nacho patrol, but we couldn’t hear anything over the sound of reckless crunching. The chips were thick–almost pita chip-like–and we could easily ignore the burntness (though they were a little under-salted). The tomatoes were fresh, and we enjoyed the guac, though we doubt it was homemade. As you could probably predict, the meat was the real stand-out of these chos. Oh-so-moist, oh-so-succulent, oh-so-flavorful! We were torn over whether or not we wanted a sauce…Oh, the selection of sauces! In our experience, BBQ sauce doesn’t go well with the overall palate of ‘chos, and it would probably be a shame to cover up the perfectly seasoned pork. Distribution of Toppings: (7) New restaurant, same distribution problems. Naked chips, sparse cheese, and a sour cream avalanche that smothers everything toward the bottom of the plate. Dare we say it, but there were perhaps too many toppings and not enough chips! Price: (7.5) The one flaw of off-menu-Groupon-nachos is that you have no idea what they cost. After some shaky math, we estimate they were about $13, which is a lot by Nacho Patrol standards, but cheap in the grand scheme of BBQ. You should never order off the “American”menu at a Chinese restaurant, and you should never order anything but BBQ at Redbones. So, while we wholeheartedly endorse these nachos, we implore you, don’t even bother unless you get them with the off-menu pulled pork. It’s shocking and disappointing that Redbones doesn’t even list pork nachos as an option. So for now, we are classifying these as “specialty nachos”, separate from the Best of Boston list. Redbones, if you want to be a contender, put these on the menu! ← Happy Cinco de Drinko!